A crowd gathered at Boston Common on Saturday. That’s what many women are wondering as they consider Saturday’s third annual women’s marches planned in Washington, Boston, and cities across the country. The movement that united women in spontaneous fury two years ago has itself broken down into divisions, as one of its national leaders, who is black, has failed to dispel perceptions of anti-Semitism. The marches come three months after a Supreme Court nominee accused of sexual assault was confirmed, solidifying a conservative court that could well overturn Roe v. Wade, the ruling that legalized abortion. And President Trump — whose inauguration prompted women’s first outpouring of anger — is still president and still offending them, even if he no longer surprises. Women participating again this year suggest the march is not the point of their activism, but the exclamation point. In between marches, organizers are keeping the grass roots aflame long after the scorching anti-Trump signs are squashed. For evidence of their impact, they say, look no further than the wave of women newly elected to political office. Headlining this year’s march in Boston: Representative Ayanna Pressley, whose upset win made her the first black woman to represent Massachusetts in Congress. Plans for the Washington march — always down to the wire — have been especially spotty amid a government shutdown, a bad weather forecast, and a racially divisive controversy that has cost the D.C. leadership team sponsors and participants. The Boston event — beginning at 10 a.m. on Boston Common — is run independently of the national women’s march but is suffering from brand confusion. 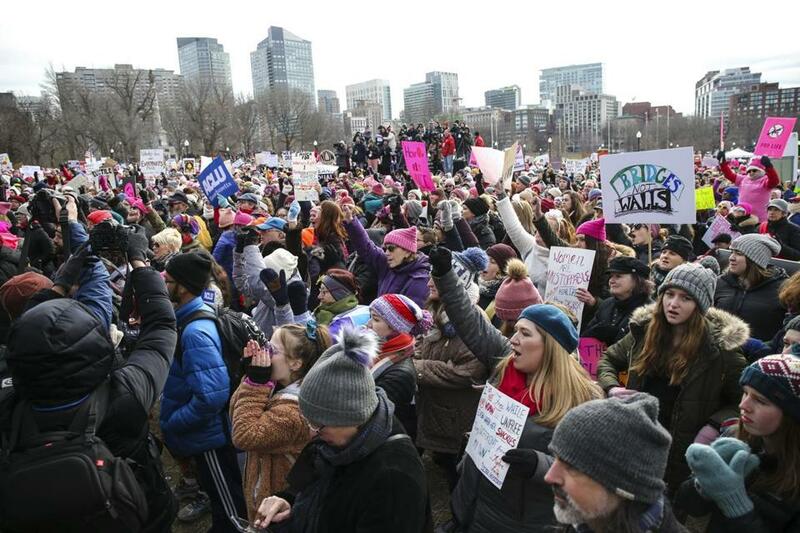 “Without question, the controversies surrounding [Women’s March Inc.] and its leadership have complicated our efforts to organize this year’s march, even though we have no connection to [Women’s March Inc.] formally or informally,” said Karen Clawson Cosmas, executive director of the Boston event’s host, March Forward Massachusetts. March Forward Massachusetts is the group that drew an estimated 175,000 people to the Common the day after Trump’s inauguration in 2017. A second annual demonstration was moved to Cambridge, planned with partner organizations, and drew roughly 10,000. But for most women mobilized by the marches, the real work has been happening in between the events. Nationally, in all-politics-is-local fashion, many women worked through “huddles,” neighborhood groups formed to work on their own electoral agendas. In Massachusetts, many campaigned for Question 3, the ballot question that protected transgender people’s rights against discrimination. And since the state was already secure with an all-Democratic congressional delegation friendly to women’s rights, some turned their progressive attention to candidates in other states. The Walnut Street Huddle in Brookline, for instance, raised money for Pennsylvania’s Chrissy Houlahan and made phone calls for Lauren Underwood of Illinois and Gina Ortiz Jones of Texas. Closer to home, they hit the pavement for Jared Golden in Maine and Chris Pappas in New Hampshire. Organizations that work with the march also have seen a surge in activism from new volunteers and channeled them to new forms of political engagement. The Jewish Alliance for Law and Social Action created a new political arm, called JALSA Impact, which tapped 100 volunteers to make 4,500 phone calls for five congressional candidates, including Abby Finkenauer in Iowa, Debbie Mucarsel-Powell in Florida, and Antonio Delgado in New York. Activists’ eagerness to tout their Jewish values and allies this year owes to the controversy that has been brewing behind the scenes. Tension only worsened after another original founder of the national march told The New York Times that she believes she was shunted aside, in part because of her Jewish identity. The dispute has become so heated that the Democratic National Committee backed out of sponsoring the D.C. march and the Jewish Telegraphic Agency provided a list detailing which local marches are not affiliated with the national leaders. In a Monday appearance on ABC’s “The View,” Mallory continued to defend her loyalty to Farrakhan based on his work for the black community. Though she said she did not agree with his anti-Semitic remarks, she refused to condemn them. Now, in a vivid display of the division, major cities — including Washington, New York City, and Philadelphia — will host two separate women’s marches. One will be affiliated with Women’s March Inc. — the name trademarked by the official national leaders — and one will be staged by local activists who do not want to be associated with that group. Some of those who still want to march are tuning out the rancor. “I’ve become an activist since the women’s march,” said Ward, a neuroscientist who said that she’d previously never felt the need to protest during her three decades in liberal Massachusetts. So she and her sister are again heading to Washington, where she’ll feed off the energy for the next round of activism back home.